Every year, Chinese families all over the globe celebrate Chinese New Year by dressing in auspicious colours, visiting each others’ houses and indulging in yummy snacks. And of course, meeting over reunion dinner. To me, what makes Chinese New Year so special is the annual reunion dinner. It’s a time for me to dine together with my entire family, enjoy a piping hot meal and catch up with the past years’ happenings. I know how important food is to us Singaporeans, and that’s why choosing the right restaurant to have your CNY reunion dinner is so important. For the year of the boar, there are quite a few pig-themed dinners for your family to pig out to. 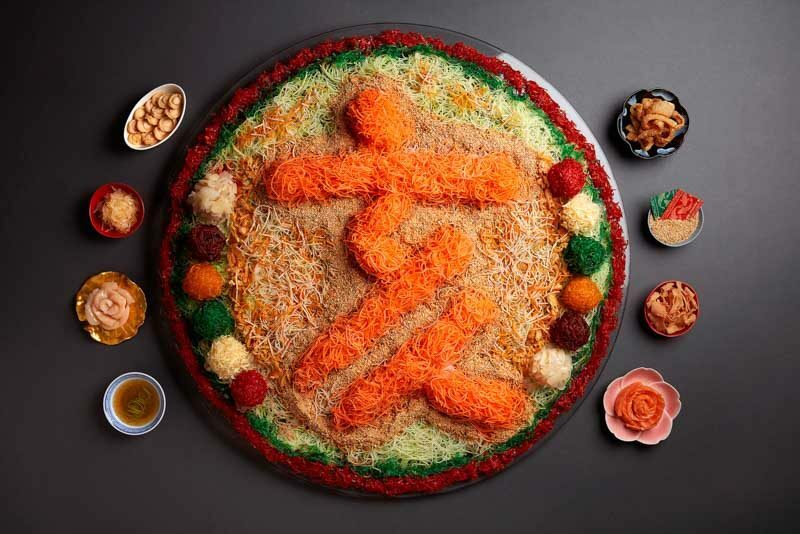 Try the exquisitely crafted yusheng platters at InterContinental Singapore‘s Man Fu Yuan (满福苑), including an insanely enormous 60-inch yusheng platter that you have to order three days in advance. Their indulgent eight-course menus feature the freshest ingredients and cater to almost any palate, so they’ve got you covered this Chinese New Year. The CNY menus are available until 19 February 2019, and start from S$108 per guest. 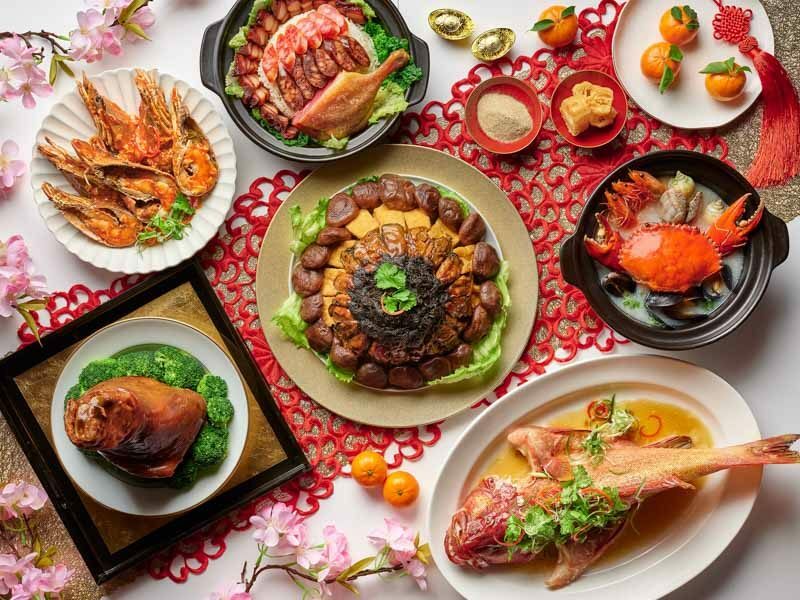 If you’re looking for something lavish, try the 八方来财 Wealth Menu (S$1888++ for 10 guests, S$188++ per additional guest), which starts off with the Prosperity Yu Sheng with baby abalone, Hokkaido scallops, and salmon and moves onto Bird’s nest soup in a pumpkin. 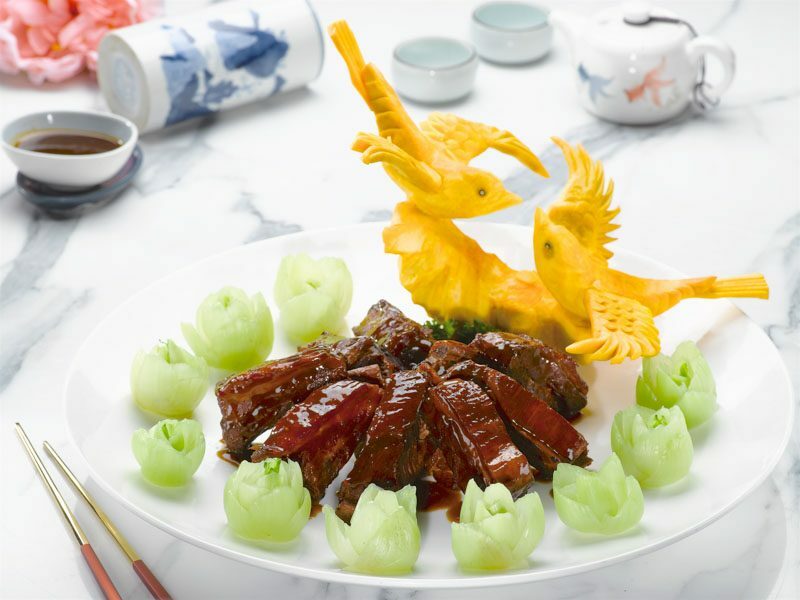 You can also expect scrumptious dishes such as Braised five-head abalone, sea cucumber, and flower mushrooms and the restaurant’s Signature West Lake Longjing tea-smoked duck. 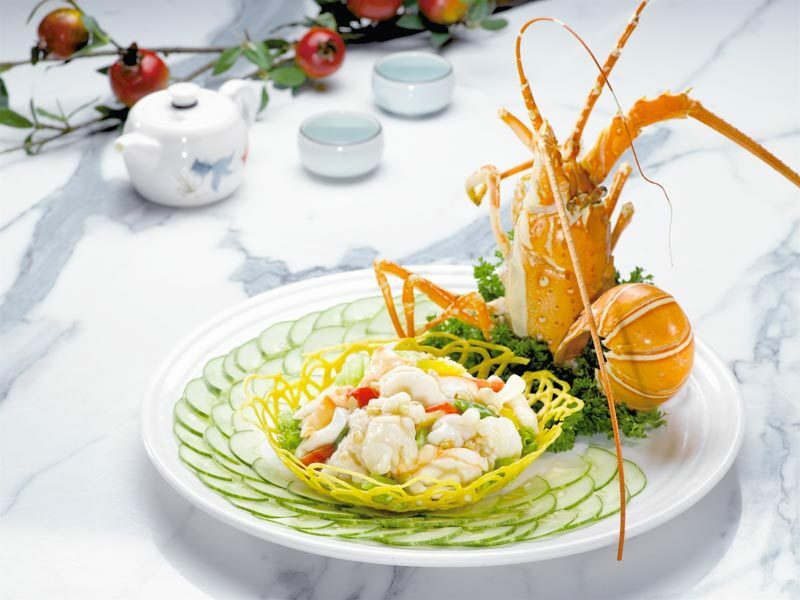 For those with smaller appetites, the 三羊开泰 Abundance (S$268++ per pax) menu caters to a minimum of two people. The six-course menu includes luxurious dishes, such as Mini Buddha jumps over the wall, Miso shoyu baked cod withscrambled egg whites and Lobster egg noodles with X.O. chilli sauce. The Lobster egg noodles with X.O. chilli sauce is simple but satisfying, with fresh, sweet and firm lobster meat and egg noodles that were absolutely slurp-worthy. Pig out with nine mouthwatering menus that feature Cantonese cuisine for both lunch and dinner sessions, available from 21 January – 19 February 2019! Xin Cuisine Chinese Restaurant from Holiday Inn Singapore Atrium has brought back crowd favourites, such as its Xin’s Gold Leaf Salmon Yu Sheng and Xin’s Abalone Treasure Pot (Pen Cai) just for the festive season. Indulge in lavish dishes such as Steamed Marble Goby with Light Soya Sauce & Crispy Bean. Pair them with nourishing and wholesome soups, like its Double-boiled Chicken Bouillon with Sea Bamboo Shoot & Ling Zhi Mushroom. For those who love a good crackling pork dish, Xin Cuisine Chinese Restaurant’s Trio Barbecued Meat Platter (Roasted Pork, Soya Chicken, Roasted Duck) is a definite must-try as well. The nine menus differ in the number of courses and the number of people it can cater for. For example, the Blissful Banquet Menu (Starts from S$588++ for six persons) covers an impressive eight courses, while the Lunch Set Menu (Starts from S$428++ for five persons) covers six courses. If you’re looking to have an intimate and small reunion dinner, go for its Auspicious Menu (S$188++) which caters for a table of two or more. Going all out this Chinese New Year and looking to impress? 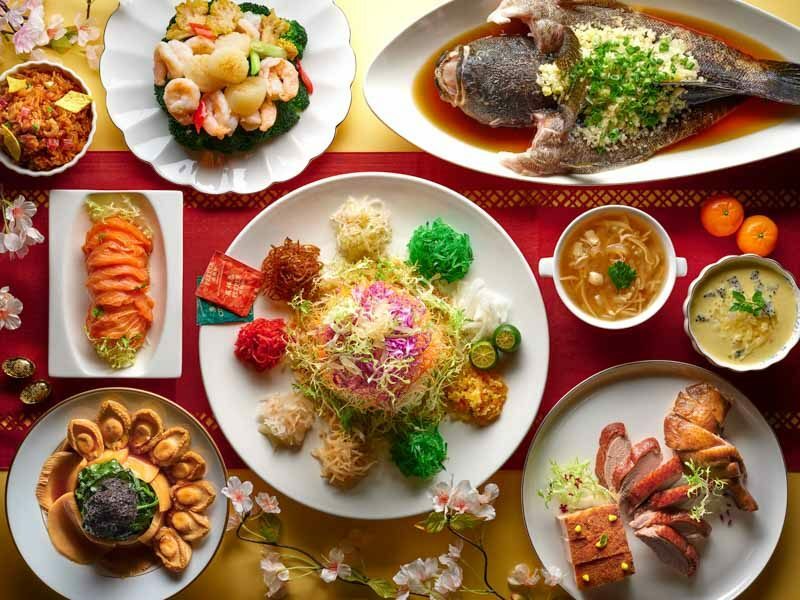 Xin Cuisine Chinese Restaurant’s most premium set menu is the Golden Bliss Menu (S$1898++/five pax, $3796++/10 pax) and it requires you to order three days in advance. Look forward to decadent delights, such as 2-Head Abalone Yu Sheng, Roasted Suckling Pig and more. But the highlight is definitely Xin’s Imperial Sea Treasures Pot Whole Abalones, Fish Maw, Sea Cucumber, Dried Scallops, Goose Web, Flower Mushrooms, Pig’s Trotter, Dried Oyster and Black Moss. 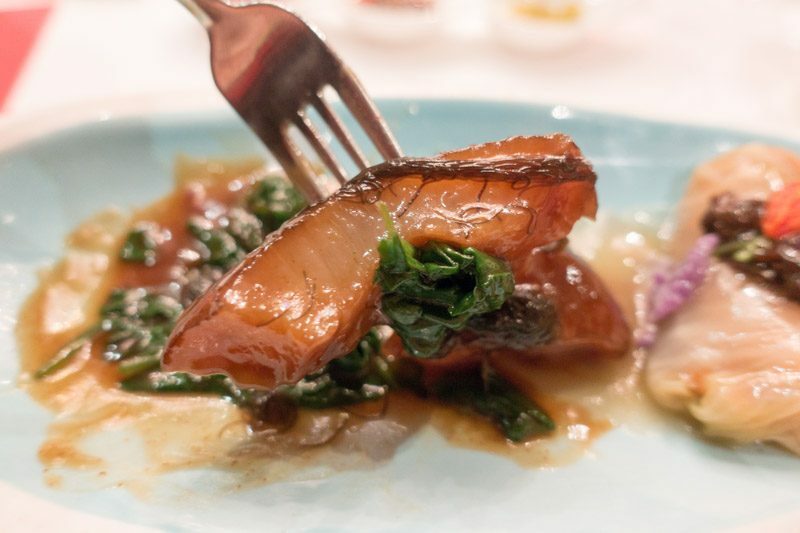 If you’re looking to bring your CNY reunion dinner experience up a notch, try Madame Fan. This Chinese fine dining restaurant is decked out in red velvet chairs, lush carpets, with live theatre and musical performances every night. 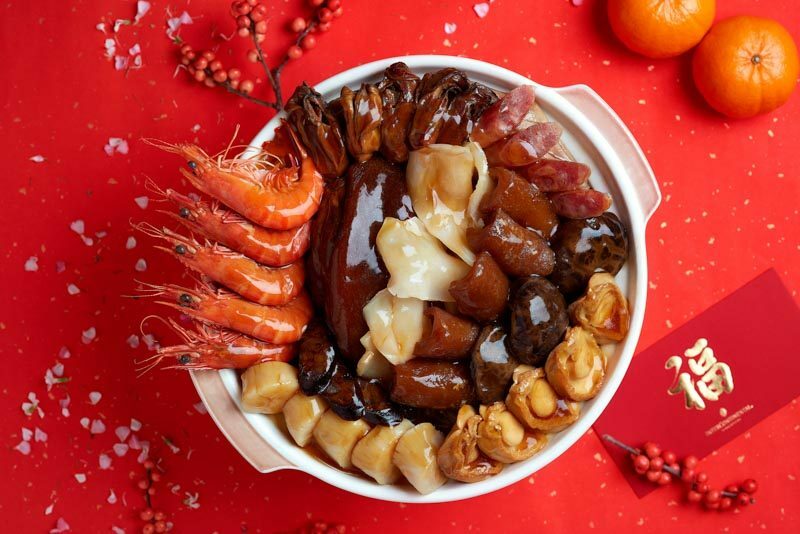 Its newly launched CNY Premium Dinner Set Menu (S$238++) includes traditional Chinese dishes, such as Bird nest, crab meat and crab roe with supreme stock and Braised King Prawn, ginger and spring onion with Ee Fu Noodle. 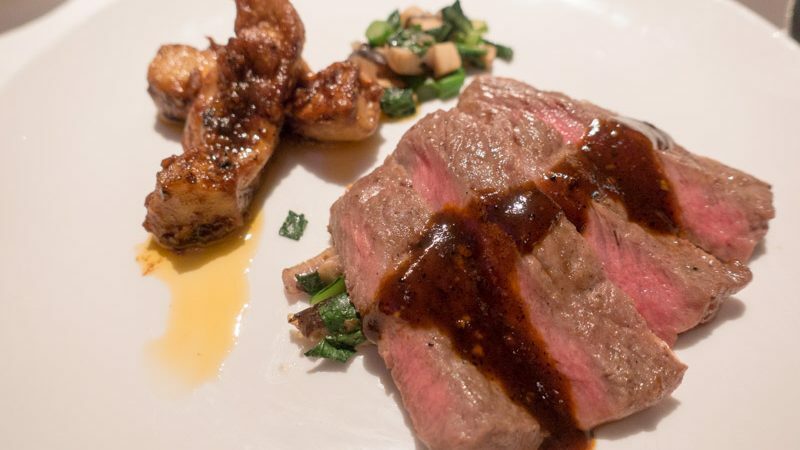 At the same time, the dishes incorporate delicious Western twists such as Charcoal Grilled Wagyu with Foie Gras. I absolutely loved Madame Fan’s Prosperity Yu Sheng because of how zesty and refreshing it was. It had more fruits than vegetables, and I spotted unique ingredients like crispy rice noodles, purple cabbage, silverfish, pomelo, and green mango. The yusheng wasn’t drenched in sauce, which made the fruits and vegetables crisp and light. For those with a lower budget, Madame Fan also has other menus, such as its Set Lunch Menu (S$78++ per pax) or its Dinner Menu (S$128++ per pax). All Chinese New Year reunion dinner menus are available from 16 January – 19 February 2019. What better way to usher in the Year of the Pig than with some crackling pork? The Butcher’s Kitchen is bringing in three new pork dishes just for the festive period, and they’re bound to be a huge hit with the entire family! Departing from the usual fish-based yusheng, The Butcher’s Kitchen is reinventing the classic lou hei by introducing elements of pork, just in time for Chinese New Year. Its 3 Treasures Porky Yusheng (S$38.80) comprises three main ingredients: golden roast pork belly, pork lard and char siew. Tying in the three ingredients together is a tangy and sweet plum and char siew sauce. Its other two new dishes are Char Siew Pasta with Truffle (S$18.80) and Mala Pasta with Roasted Pork Belly (S$18.80). Both pasta dishes incorporate pork in some way. The Char Siew Pasta with Truffle is fragrant, sweet and piquant, with homemade char siew sauce and melt-in-your-mouth pork belly. On the other hand, the Mala Pasta with Roasted Pork Belly is available in three levels of spiciness for that tongue-numbing and peppery mala goodness. Featuring traditional Peranakan fare, Folklore from Destination Singapore Beach Road prides itself on its homely recipes that were passed down from Chef Damian D’Silva’s maternal Peranakan grandmother. Expect soulful and heartwarming dishes this Chinese New Year, such as Peranakan Mee Siam (S$16++), Garang Assam with You Tiao (S$34++) and Sayur Kailo with Pork Ribs (S$32++). 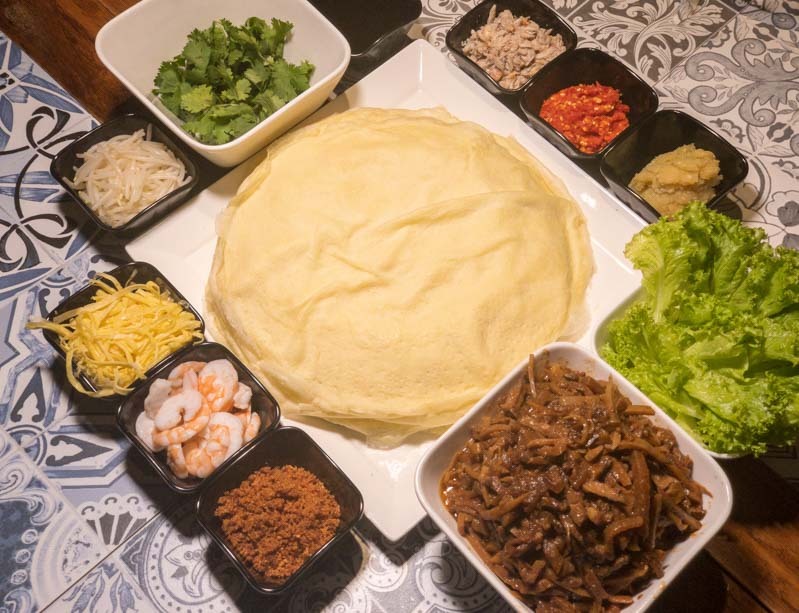 If you love to get your entire family to join in an interactive and DIY meal together, Folklore also offers a unique “Do It Yourself” Popiah Set (S$60++/4 pax) experience. End the meal off on a sweet note with Chef’s Selection Kueh Platter (S$14++). Indulge in a platter full of sweet and timeless classics such as Apom Berkuah, Ang Ku Kueh and Kueh Salat. The Chinese New Year selections are available from 4 – 19 February 2019. Goodwood Park Hotel Singapore‘s Min Jiang needs no introduction. Famed for its contemporary oriental furnishings and its award-winning Si Chuan and Cantonese dishes, Min Jiang’s Chinese New Year offerings span across seven decadent menus (S$118++ per pax to S$1838++ per table for 10 pax). They feature everything from salmon and abalone yusheng, braised bird’s nest soup to roasted boneless suckling pig. The Chinese New Year selection is available from 18 January – 19 February 2019. 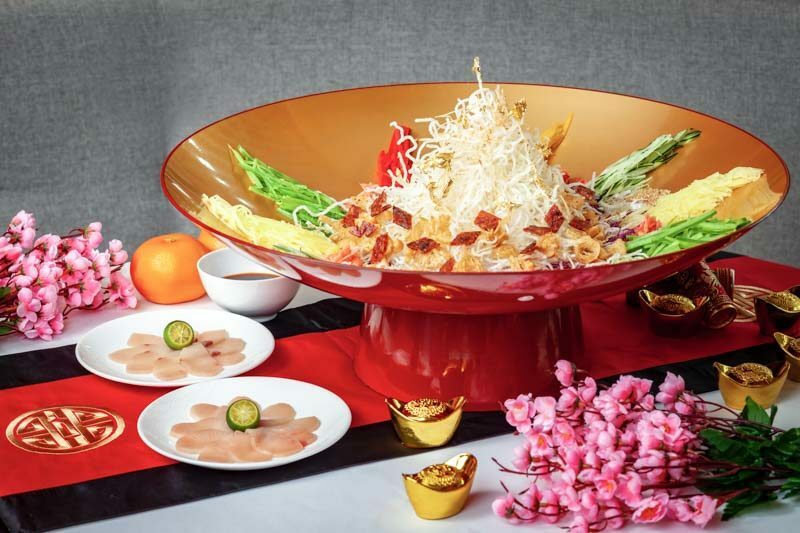 The Prosperity ‘Fa Cai’ Yu Sheng 发财鱼生 (S$168++ per large portion only) is not only a tangy and delicious dish containing raw salmon slices, abalone and a variety of crisp vegetables such as wild arugulas, yellow frisee and red sorrels. 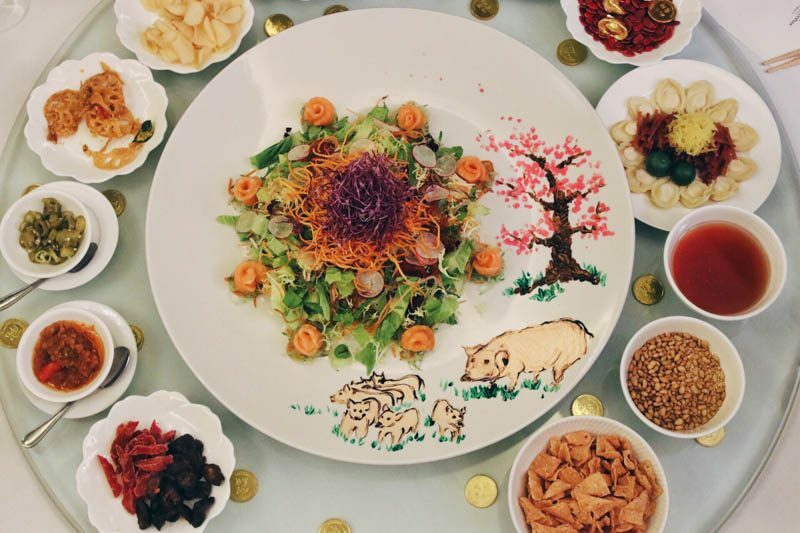 The gorgeous painting on the plate is personally illustrated by Master Chef Chan Hwan Kee and features eight pigs enjoying a stroll along a grassy field. If you want to try a little bit of everything, go for Min Jiang’s Everlasting Harmony lunch set menu (S$488++ per table of six pax, S$688 ++ per table of 10 pax). The highlight of the menu is the Deluxe Platter that features four meat dishes. These include the piquant chicken dish with sesame, a tangy Sichuan style smoked duck in spicy plum and lemon dressing, crispy prawn with mango mayonnaise dressing, and wok-fried Kurobuta pork loin with sour plum. 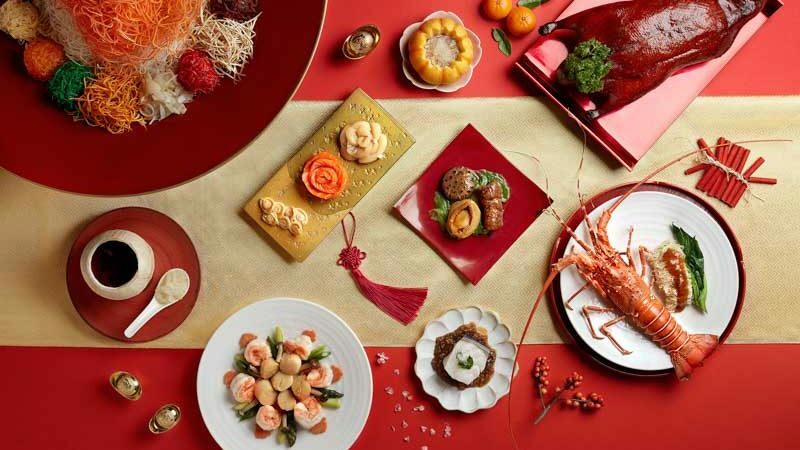 Located on the fifth floor of National Gallery Singapore, Yàn‘s Chinese New Year set menus (from S$128++ to S$278++ per person) are honestly nothing like I’ve ever seen. They’re available from 18 January – 19 February 2019. 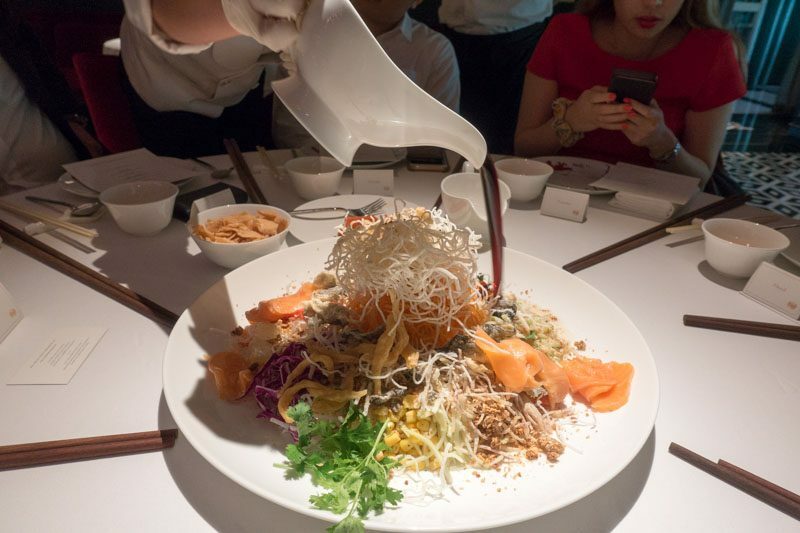 Its innovative creations include its signature Kaleidoscope of Prosperity Yu Sheng, which is topped off with a mountain of vermicelli that’s fried upon order. 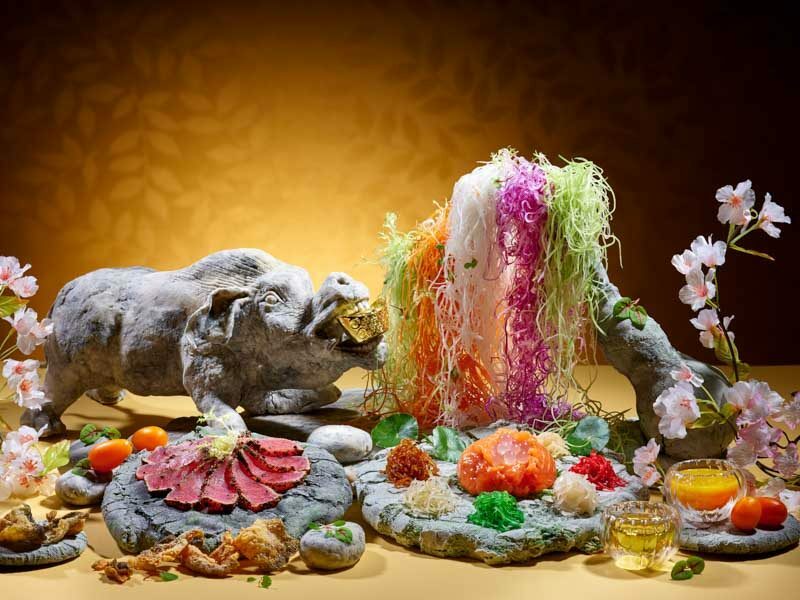 What’s so magical about this particular yusheng is the assembly of all the ingredients. 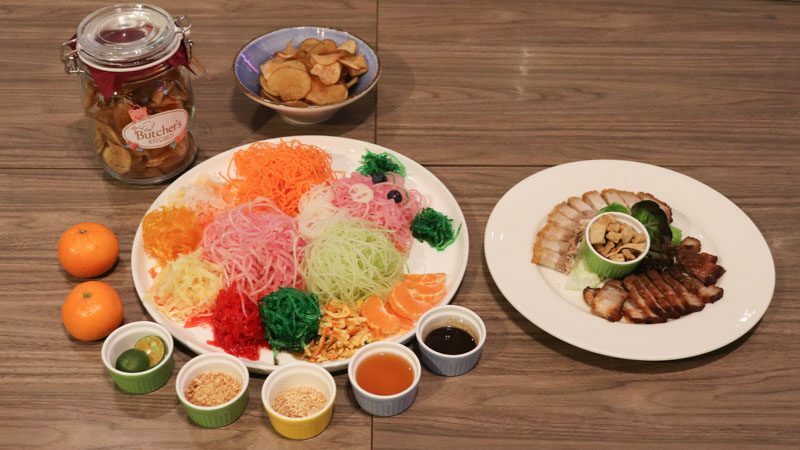 When the soy sauce-based dressing is drizzled over the colourful yusheng, the fried vermicelli lets out a crackling sound, imitating the sound of firecrackers. Plus, this particular yusheng incorporates unique ingredients, such as bak kwa, crispy youtiao and fried yam. 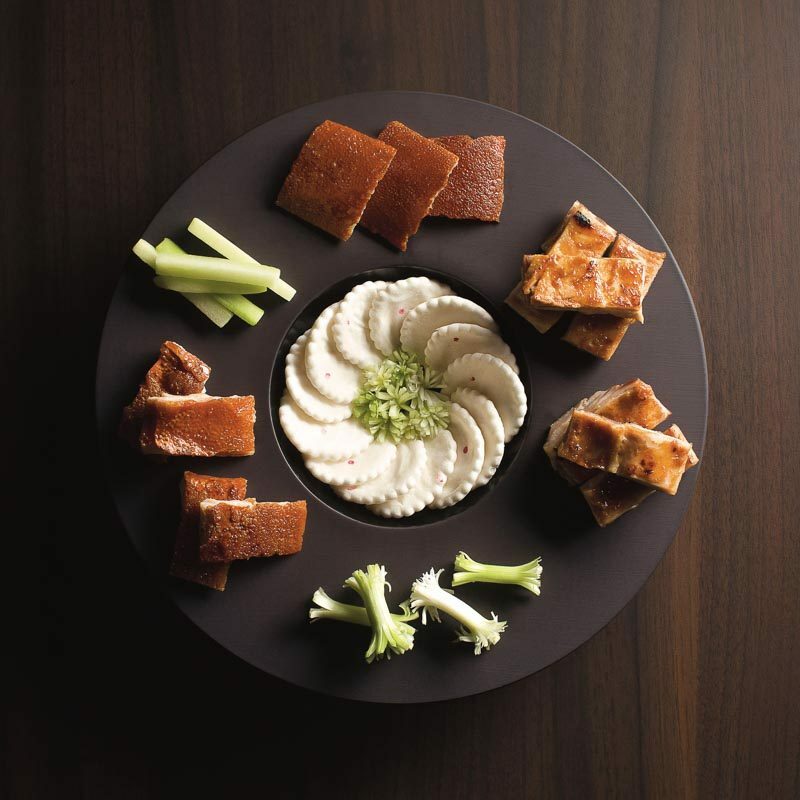 To usher in the Year of the Pig, Yàn is also offering the Signature Roast Crispy Suckling Pig, which is served in three ways. First with a house-made pancake with plum sauce, cucumber and onion sticks, the second way with carved pig shoulder slices, and the third with oven-baked pig fillet with lemongrass. Served in a massive bowl, Yàn’s Braised ‘Mee Pok’ with Fresh Mushroom and XO Sauce is a playful nod to one of Singapore’s favourite local dishes. In this particular version, the mee pok is sauteed with a house-made XO sauce that consists more than 20 ingredients, including dried scallops, jin hua ham, prawn row, chilli and salted fish. Housed within 15 acres of tropical gardens, Shangri-La Hotel, Singapore is a fantastic place to have your Chinese New Year reunion dinner if you’d like to get away from the bustling city and crowd. This palatial luxury spans three buildings and houses several acclaimed dining destinations, two of which are great choices for your Chinese New Year reunion dinner. 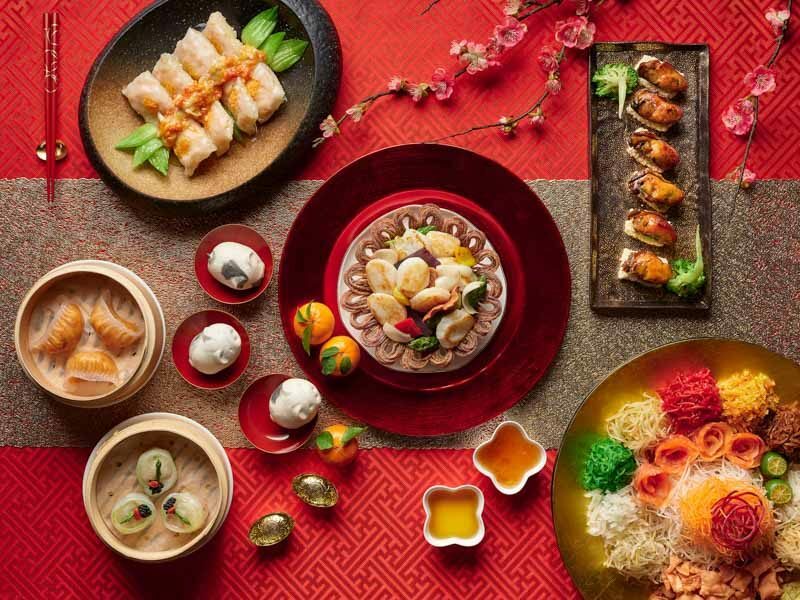 Inspired by the rich heritage of China, Shang Palace‘s seven- and eight-course set menus (from S$118++ per pax to S$328++ per pax) showcase authentic Cantonese cuisine that is bound to impress your relatives. The menus are available from 21 January – 19 February 2019. From Braised bird’s nest with Alaskan crab meat and fish maw to Hong Kong style steamed coral trout, or even the famed Buddha Jumps Over The Wall, Shang Palace has definitely got you covered. One of my personal favourites from its reunion dinner set menus was definitely the Baked Sea Cucumber with Shrimp Roe accompanied with Braised Cabbage Roll filled with Vegetables and Morel Mushrooms. The sea cucumber itself was thick, soft and slightly gummy in texture. Just looking at the size of the sea cucumber alone was enough to make me feel like royalty for that few minutes. It was so silky smooth that it slid off my fork while I was trying to snap a photo! For those who are fans of buffets rather than sit-down dinners, Shangri-La Hotel, Singapore’s The Line restaurant might be more up your ally. It’s bringing in Chinese New Year-themed stations for its buffet line, so expect delicacies such as Chili Crayfish, Szechuan Mala Fish, as well as Shanghai Braised Pork Trotter. 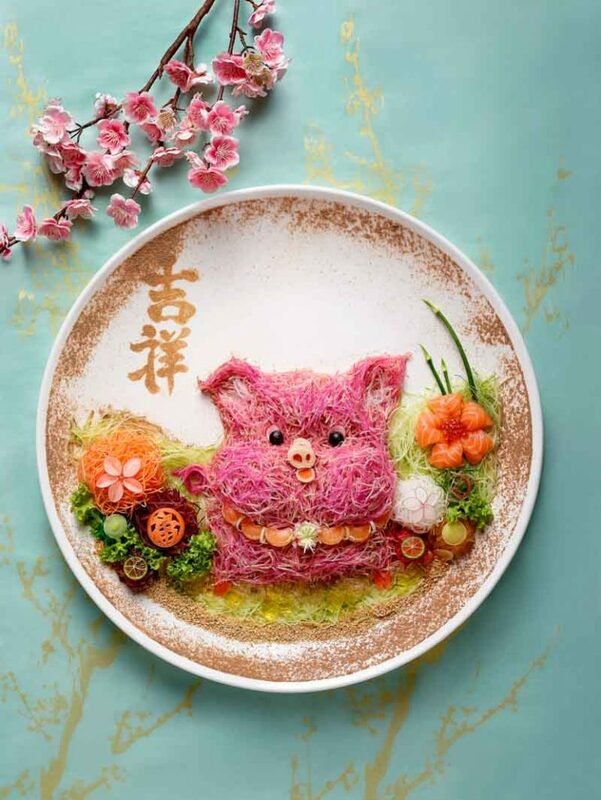 Fancy a yusheng artfully assembled to look like a cute little piglet? That’s Jade‘s highlight this year for sure. Located within The Fullerton Hotel Singapore, Jade’s picture-perfect Gold Rush Yu Sheng takes a painstaking one-and-a-half hour to recreate. It comes with lobster, Norwegian salmon, Australian abalone, pink and white radish, as well as other fresh vegetables such as beetroot, cucumber, carrots and capsicum. Another pork-inspired dish created just for this auspicious season would be Jade’s Braised and Roasted Pork Belly in Steamed Bun (S$38+ per portion of four). The succulent pork belly is cooked in two ways: first by braising in a soy-sauce based recipe, and the second by roasting till crispy and golden brown. Both types of pork belly are tucked into a homemade steamed bun alongside finely shaved pickled carrot, radish and apple, and served on fresh coral lettuce. Complete the heartwarming reunion dinner with Hot Eight Treasures Soup with “Tang Yuan” and Bird’s Nest (S$13+ per person, S$48+ with a shooter glass of cave bird’s nest). This nourishing and sweet soup includes red dates, dried longan, lotus seeds, snow fungus, chia seeds, luo han guo, peach gum and dried persimmons. Jade’s Chinese New Year menus are available from 21 January – 19 February 2019. 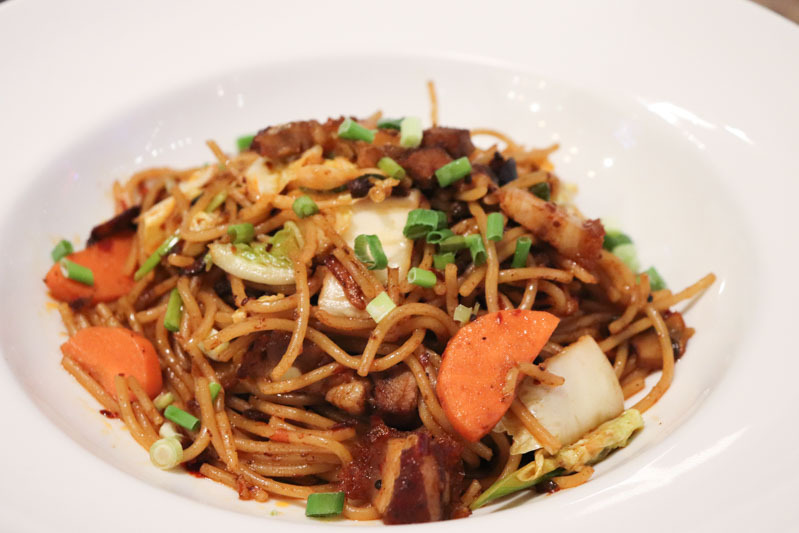 Joyden Concepts is a Singaporean-owned family business that has been in the F&B industry since the 1980s, It has three restaurants under its name: Joyden Treasures, Joyden Canton Kitchen and Joyden Seafood, all of which pay homage to its roots and heritage. For Chinese New Year, Joyden Concepts has brought in special creations. The Braised Wuxi Prime Ribs (Available in seven menus) have been coated with a special house sauce comprising honey, glutinous rice wine and spices, then braised for hours to ensure that it’s fall-off-the-bone tender. The dish is also plated to resemble a mountain of fortune, and it’s surrounded by green bok choy to symbolise wealth and prosperity. If you’re looking for showstoppers, Joyden Concepts’ Wok-Tossed Lobster Medallions with Scallops and Pine Nuts (Available in Available in three menus) pairs a juicy and succulent lobster with fresh scallops, fresh cut seasonal greens and pine nuts. Not only is the fresh lobster plated upright for an impressive look, but the scallops are also presented in a delicate little crisp bowl for that extra oomph factor. Its 15 Chinese New Year menus are available from 14 January – 19 February 2019 and span across all three Joyden outlets. They’re priced from S$298 to S$1,188 per table. With all the scrumptious offerings this Chinese New Year, I honestly wish I had a big enough stomach (and wallet) for all the mouthwatering delicacies that come around only once a year. From intricately plated yusheng to impressive pen cais and pork-inspired dishes to usher in the Year of the Pig, here’s wishing you and your loved ones a prosperous Lunar New Year. Let the feasting begin!